This project was in a house that was over 100 years old! 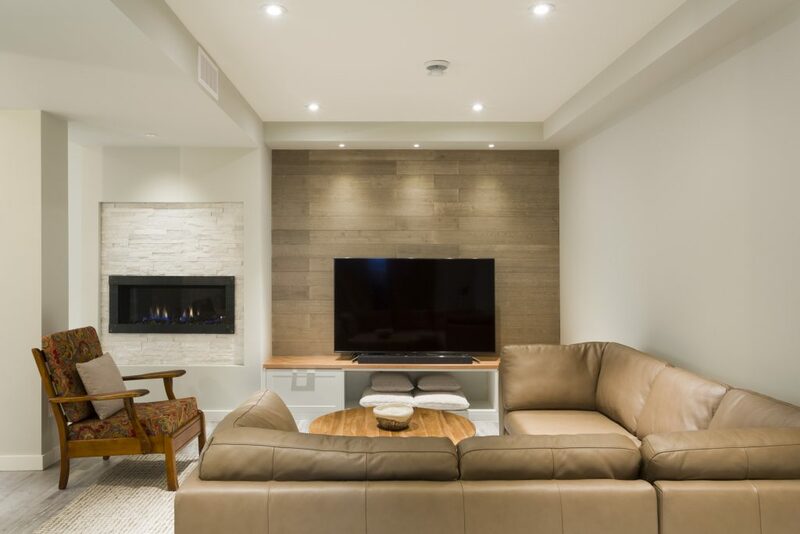 The homeowner wanted to utilize the basement for entertaining, relaxing, and watching TV. We gutted the entire space, insulated all walls, installed beautiful vinyl plank flooring, restored the original 100 year old fireplace (with 100 year old bricks we found to match! ), and built a custom wood mantle & corner shelves. We built a new wood bar-top (while restoring the red vinyl 1950’s bar! ), and added custom built wood shelves behind the bar to match. Lots of challenges in this old home – but the end result is just WOW!!! Looking for somewhere to snuggle up and get cozy with a roaring fire and your favorite novel? Or maybe the gang is looking for the ultimate party pad with bar and big screen? Yoga or ping pong anyone? 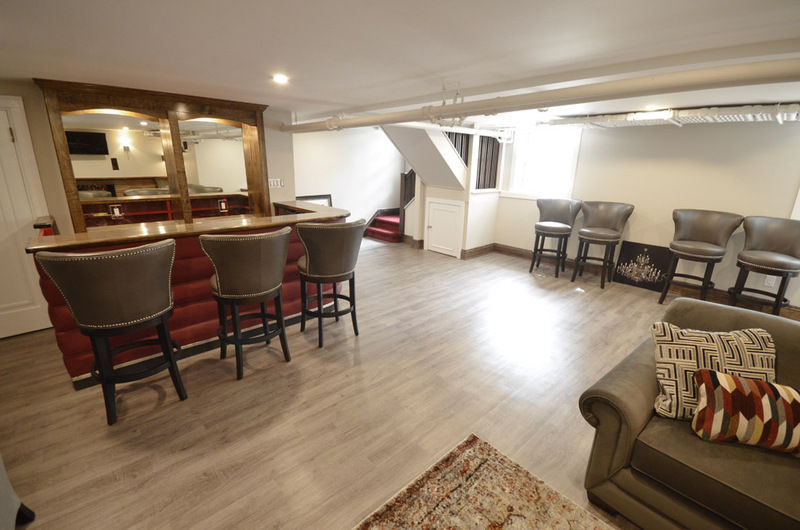 This basement is truly the ultimate hangout whatever your mood. Lodge-like entertainment space with fireplace, a huge wet bar, counter seating, and tons of storage. Cozy reading nook with a second fireplace; a workshop; full bath; bedroom and exercise space. You will want for nothing when you check into the ultimate hangout. These homeowners required additional space for their growing family, and relatives whom visit regularly. Being in one of Winnipeg’s most desirable neighborhoods, moving wasn’t an option. The old unfinished basement left much to be desired. Several issues plagued the space including foundation leaks, electrical issues, plumbing problems etc. Fixing all the issues before developing the space was key. The end result was a clean, simple, efficient space that is headache free. The client wanted to reclaim the basement that had become a clutter filled storage area. After many review meetings, we decided on creating: a flex space, bathroom, utility room with added laundry, cold storage room, storage closets, serving area with sink, library, TV feature wall, gas fireplace, exercise space! The finishes were to be light and airy, with warm wood accents and a casual scandi vibe. Our design build process enabled each decision to adhere to the client’s aesthetic and budget. The result is an organized space that met the needs and wants of these homeowners! Clutter is all gone! 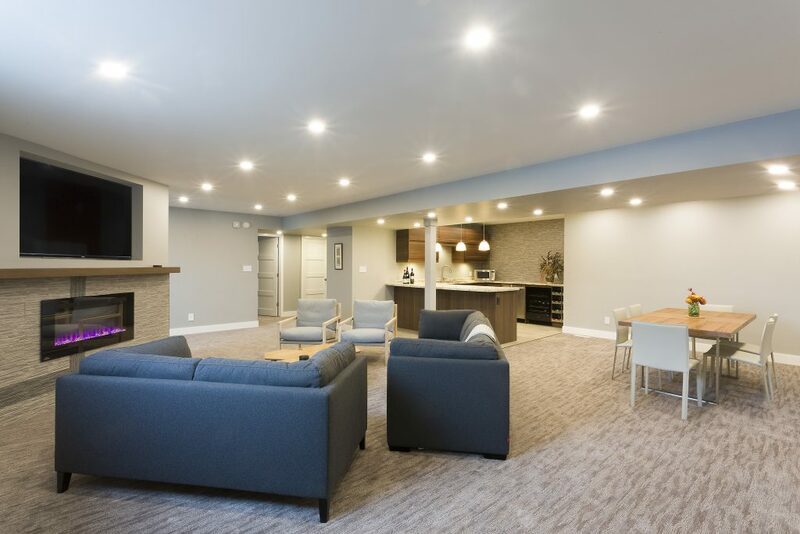 The Home Owners wanted to develop their previously unfinished basement into a modern multipurpose space. 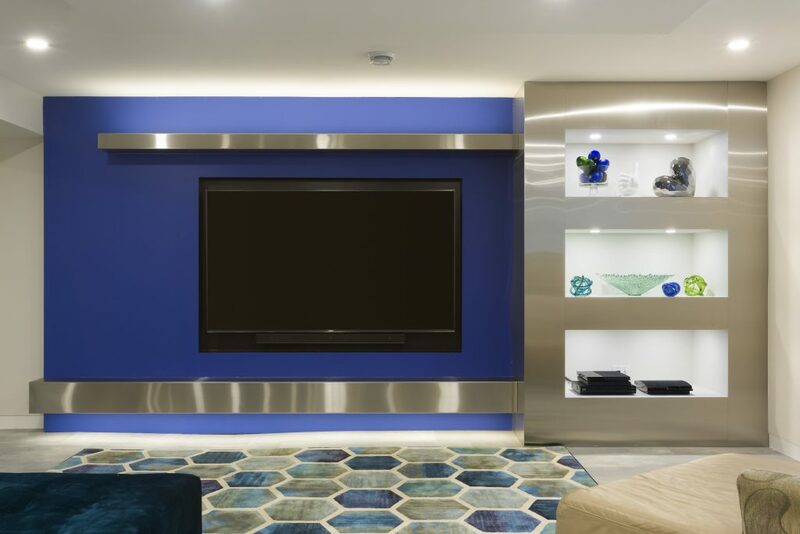 Their wish list included a casual Family Room for Audio and Visual functions. Their son plays the drums and practices with friends so a sound reduced Music was next on the list. A walk-up wet Bar including sink, fridge and microwave was developed for entertaining. 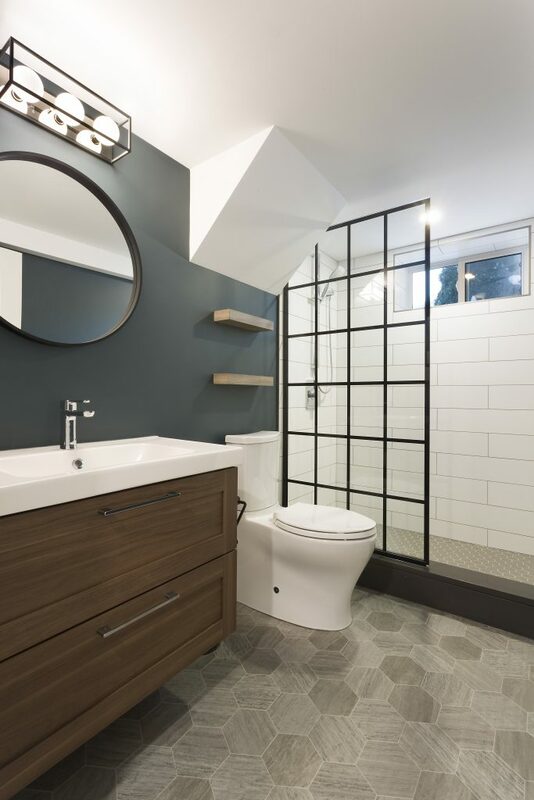 To round out the list, a full bathroom with body sprays and steam shower was included.